I'm interested in installing an over the range convection microwave, just not over my range. Is this simply a matter of ventilation and ensuring the button of the microwave has access to air and isn't covered by shelving? I&#39;m interested in installing an over the range convection microwave, just not over my range. Is this simply a matter of ventilation and ensuring the button of the microwave has access to air and isn&#39;t covered by shelving? You may install an over the range microwave below any cabinet overhanging the counter. However you cannot install it inside a cabinet. These units are not designed to sit on a shelf as they do not have feet and the filters are on the bottom of the unit. If you want to install a microwave inside a cabinet you may purchase a counter top microwave place it in the cabinet and install a trim kit to finish off the opening. 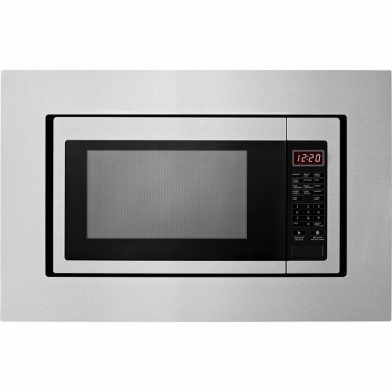 You also may purchase a built in microwave unit which installs in the same manner as a conventional wall oven.